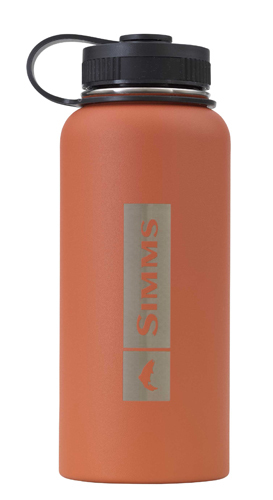 Simms Headwaters Insulated Bottle has double wall vacuum insulation to keep your hot beverages hot for up to 8 hours. The durable powder coated finish elimates sweating. This water bottle is made of food grade stainless steel and is 100% BPA free. With a wide mouth for easy filling, drinking and cleaning this 32 oz. water bottle will help you meet your water intake for the day. Dishwasher safe. - Double-wall vacuum insulation keeps beverages hot up to 8 hours or cold for up to 24 hours.